Francis E. Kirkpatrick II, age 84 passed away September 16, 2018. Veteran of the U.S Army during the Korean Conflict. 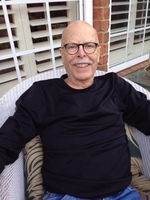 He was a retired management consultant and a member of St. Andrew Lutheran Church. Survived by: wife, Mary Jo Kirkpatrick; daughter, Tamara (Scott) Carnahan; sons, Dr. Jeffrey (Janet) Kirkpatrick and Anthony Allen (Julie) Woodruff; brother, John E. (Phyllis) Kirkpatrick; four grandchildren and seven great grandchildren. Memorial services will be conducted 12:00 Noon Monday, September 24, 2018 at St. Andrew Lutheran Church, 908 Murfreesboro Rd., Franklin, TN 37064, Pastor Katherine Museus officiating. Visitation with the family will be one hour prior to the service. Inurnment will be 2:00 PM Monday at Middle Tennessee Veterans Cemetery with military honors. Memorials may be made to St. Jude’s Children’s Hospital. WILLIAMSON MEMORIAL FUNERAL HOME, 615 794-2289.